In this first part of the tutorial we are going to create the smart contract that handles the registration of users; then we are going to deploy the smart contract to the blockchain using Truffle. If you missed the introduction and you want to know what this tutorial is about, please read the intro. Set up of the truffle environment. Deploy the smart contract to the blockchain. Note before you start: if you are using Windows you must use Power Shell as terminal. contracts: folder containing the smart contracts written in Solidity. migrations: folder containing the files that take care of the deployment. test: folder containing the files for testing the smart contracts. truffle.js: file that contains the list of blockchain networks where you can deploy your contracts. Let’s add the details of our blockchain network to the file truffle.js. So first start Ganache and, once it runs, check the host and the port as shown below. IMPORTANT: make sure that the host and the port of the code pasted in truffle.js match with the settings displayed in Ganache. Let users resister their profiles. The owner of a profile is the only person who can edit his own information. When the profile has been created and updated. What we need is to store the list of the users and associate each user with an account address (or wallet address). Let the user register his profile. Let the owner of a profile update his details. Get the list of users and their details. Check if the user is already registered. Below is the code of the smart contract (you can find it on GitHub as well). It’s time to deploy the smart contract to the blockchain! Make sure that your blockchain is running and the file truffle.js is properly set as explained before. Go to the folder migration and create a file called 2_migrate_users.js. The migration filename has a number as prefix and a description as suffix. The numbered prefix is required in order to record whether the migration ran successfully and the suffix just describes what the file is about. This command compiles all smart contracts and deploys the smart contracts to the blockchain. 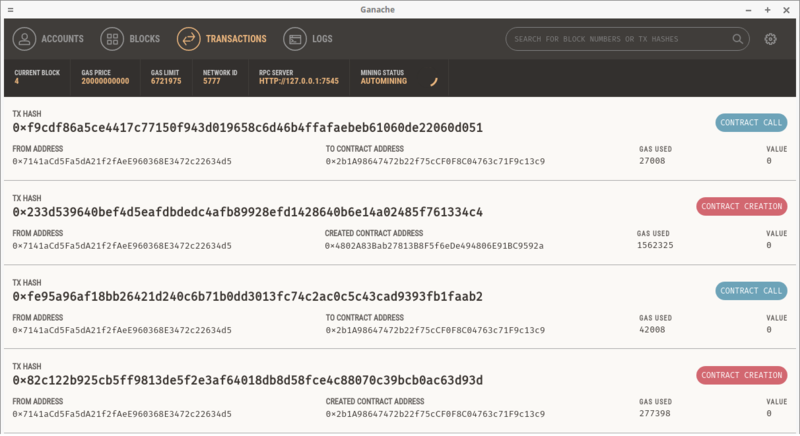 After the deployment you will see on Ganache some new transactions in the transaction list. In the second part of the tutorial we will build the dApp interface using Vue JS and interact with the smart contracts through the interface. The second part of the tutorial is on the way… see you soon! This is a simple decentralized application built using Ethereum blockchain and VueJS for the front-end. 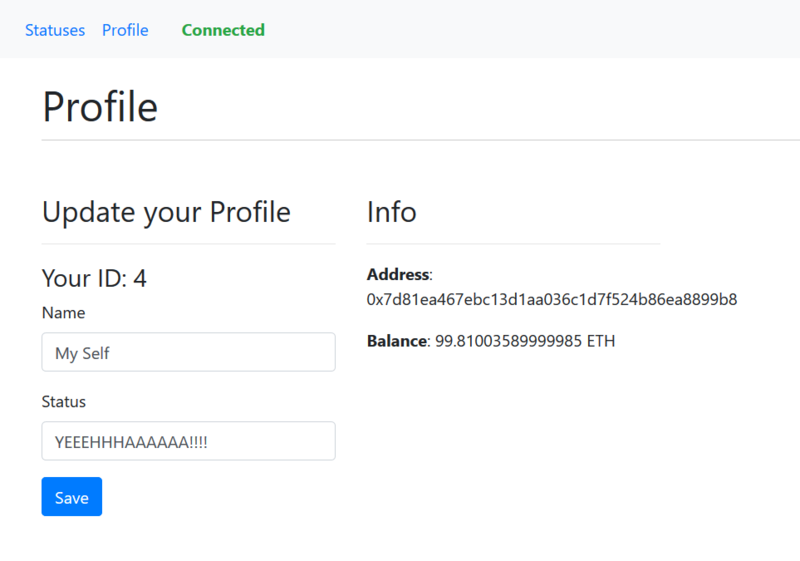 This DApp example lets the users store their name and status on the blockchain. The DApp allows users to register their name and status on the blockchain. The user’s profile is associated with an account address (or wallet address). The owner of the profile is the only person who can modify his own data. This will give you a technical explanation of what it means when the user is in control of his own data (just like Facebook… sarcasm!). The smart contract is designed to give the user control of his own information and not even the creator of the smart contract can control any data. PART 1 (coming soon): set up of the truffle environment, brief explanation of the smart contract and deploy the smart contract to the blockchain. PART 2 (coming soon): set up Vue JS and explanation of the project structure. Ganache or your private network. Metamask: not mandatory but better if you want to insert different profiles. Download the project and decompress it into the folder ~/ethereum-vuejs-dapp (or wherever you want). Start Ganache (or your private blockchain). Open the browser and go to URL above to try the DApp! NOTE: if you want to try to add more profiles you have to install metamask in your browser, then import the accounts into metamask and finally change account on metamask in order to register a new profile. Obviously in case when 100% of the community supports or does not support the hard fork there will be no blockchain split. This article showed us how a blockchain is structured. In the next article we will see how to prevent a blockchain from being tampered. In the previous article we had a quick introduction to the blockchain technology. In this article we are going to see what’s happening behind a bitcoin transaction. Let’s take a simple example: Robert and his friends went to the Bit&Beer pub where bitcoin payments are accepted. After the whole night of drinking and having fun it’s time to pay the bill! The waiter takes out a smartphone and shows the QR code to Robert for the payment of the bill. 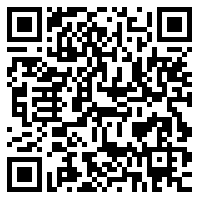 Robert takes out his smartphone as well, opens his bitcon app, scans the QR code, checks if the payment details are correct and presses the PAY button. 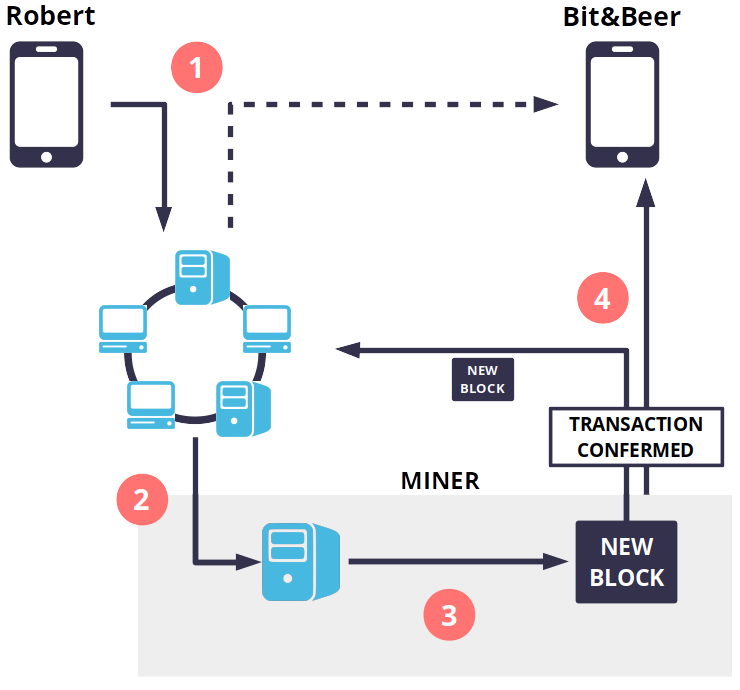 When Robert presses the PAY button he creates a new transaction which contains the sender’s ewallet (Robert) and the receiver’s ewallet (Bit&Beer) details, the amount of bitcoins and a small fee. The fee however is not mandatory: the sender can decide whether or not to include the fee (transactions with a higher fee have a higher priority). What is happening behind the scene? The transaction is propagated in the bitcoin network (phase #1 of the scheme); the waiter of Bit&Beer can see Robert’s payment on his phone almost instantly, the status however is NOT CONFIRMED. Who decides whether a transaction is valid or not? The transaction is considered valid when special nodes in the network (called Miner) will append this transaction into a block in the blockchain. to validate the transaction (referring to consensus protocol) or to reject an invalid transaction. The process of Mining is the essential phase where the transactions are stored in the blockchain. In this step the transaction is being included inside a new block and this block is appended to the blockchain. 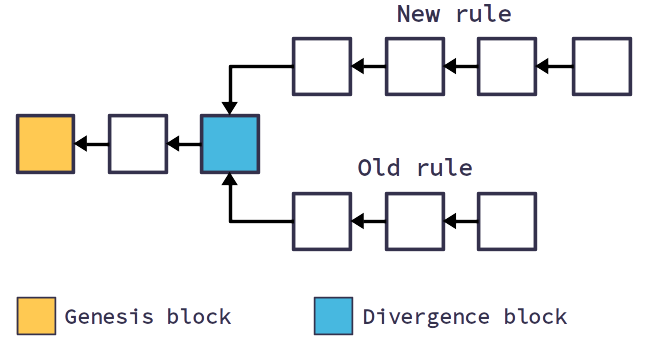 It is not simple at all to create a new block. Mining a block requires complex operations using a lot of computational power; this operation is called proof-of-work and it verifies the data on the blockchain and makes it immutable. Miners are racing with each other to create a block: the first one that creates a block which satisfies the requirements earns some bitcoins and the fee within the transactions (phase #3 of the chart). A new block is propagated on the network (phase #4 of the chart); other miners which received a new block, are going to check if the block is valid first and then include the new block in the blockchain. Finally, the waiter of Bit&Beer can see in his ewallet that the payment has been confirmed. All this process is about 10 minutes long. This article is one of several articles in which I explain in a very simple way what a blockchain is. Blockchain is the technology behind bitcoin: bitcoin cannot exist without a blockchain. It is like Internet and Facebook: Facebook cannot exist without Internet. A Blockchain is a kind of database: while a normal database is located on a server, a blockchain is distributed among the software users. For example, the Facebook’s database is located on a protected server and no one can access the information. The Bitcoin’s blockchain instead is located on servers and computers (called nodes) of all the Bitcoin users. All the transactions that occur between ewallets are stored on the bitcoin’s blockchain. All the servers and the computers that are using bitcoin have the same copy of the blockchain stored on their hard disk. There are many kinds of blockchain with different features, like Ethereum, Hyperledger, Ripple. Some of them are more suitable to handle currency, others are used to transfer the ownership of assets (eg supply chain). You don’t need to download all the blockchain to your computer in order to use Bitcoin (or any other blockchain technology) as the current size of Bitcoin’s blockchain is over 160 GB and it can easily drain the resources of your computer. To avoid this issue there are different types of e-wallets (we will talk about them later). If the bitcoin’s blockchain is on my computer, can I add 1 million of bitcoins in my ewallet? The blockchain is famous for its security: once the data is there it is impossible to modify it. The blockchain consists of a chain of blocks, where every block contains data (for instance a money transactions, documents or personal data). When a new block is to be added to the chain, it has to be verified by the network of nodes first, and once this is done, the transaction can be inserted in the blockchain. There are mining and a consensus protocol standing behind this phase (click here to read more). 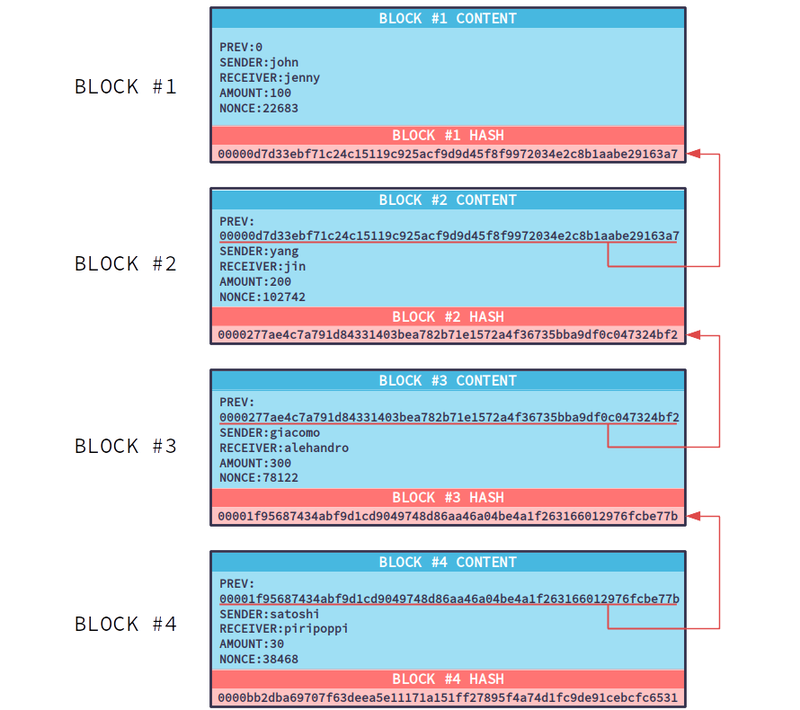 The blocks are connected with each other in a way that if I edit the content of one block I must edit all the following blocks, moreover to edit a block you need the consensus of other nodes. Hence the more people are using a blockchain, the longer it is and the more secure the system is. At present there are over 9000 nodes in the Bitcoin system. Are you telling me that the blockchain has no flaws? Technically it is possible to break into the blockchain but you will need more than half of the computational power of the whole world (so basically it is impossible). Experts are worried that blockchain cannot resists a quantum attack. A quantum computer is a next generation computer with a huge computational power, it is being developed in Google’s laboratory. It can come out in 10 or 20 years but by that time also the blockchain technology will evolve. For instance Iota is a new kind of blockchain with a different structure and it can resists a quantum attack. Why don’t we continue using a normal database as we did so far? The blockchain is shaking many industries but it cannot be used everywhere. For example there is no sense in using blockchain to store the data of this website. But it makes a big difference when the third party is involved. If you have to transfer money, the bank is the third party that takes the money from you and transfers it to the recipient. In the Bitcoin system there is no one between you and the recipient, the transfer is direct, and it takes around 10 minutes. The blockchain technology is applied in many industries such as music, real estate and energy. The company where I work uses the blockchain technology in the notary industry. Thanks! You convinced me! Now I’ll buy 1000000€ in Bitcoin!!! Wait a moment! The blockchain world is wonderful but risky. There are legal and technical details that you have to understand. In several countries Bitcoin is not regulated. For instance if I steal from you 10000€ you can sue me. If I steal from you 100 bitcoins and you go to the police, the policemen will tell you that the Bitcoin has no value. From the legal point of view, to steal the bitcoins is like to steal the air! You cannot sue me for stealing something without value. Keep yourself updated with regards to the cryptocurrency laws of the country you live in. The blockchain is a technology that is still evolving, some technical problems can arise with its development as well. For example in 2016 a bug in the Ethereum cryptocurrency system resulted into a loss of 50 million dollars suffered by many users. On the other hand, many investors took the risks and became rich. It’s important to be updated, rely on tested technology, use safe systems for money deposits and not to search for easy ways to make money.